Published: Sept. 30, 2018 at 01:46 p.m.
Miami Dolphins cornerback Bobby McCain picks off New England Patriots quarterback Tom Brady in Week 3. 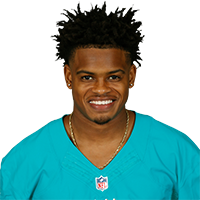 Published: Dec. 31, 2017 at 07:47 p.m.
Miami Dolphins kicker Cody Parkey kicks an onside kick and cornerback Brice McCain recovers for Miami. Published: Dec. 3, 2017 at 01:32 p.m.
Miami Dolphins safety T.J. McDonald comes up with huge interception vs. the Denver Broncos in Week 13 of the 2017 NFL season.